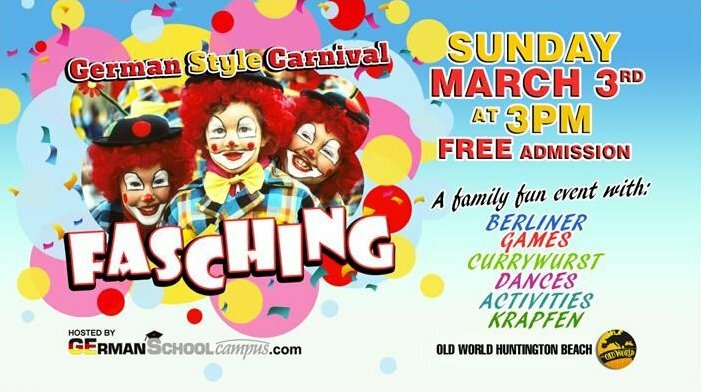 Have your cute costumes on and join us for a fun filled afternoon for the kids and families with lots of activities hosted by the Teachers of German School campus. We start at 3:00pm , come in time to get the most out of all games and dances. Old World will host with good food like the traditional “Currywurst”, with coffee and the famous “Berliner”, we never miss in a German style Carnival. 28th February – 5th March 2019 is the real Cologne Carnival. The “fifth season of the year” as Carnival is called, begins on November 11th at 11:11 a.m. But the real “crazy days” do not start before the so-called Weiberfastnacht (Shrove Thursday), the Thursday before Rosenmontag (Carnival Monday). The “crazy days” of Carnival are celebrated with parties on the streets, in public squares and in pubs. German School campus brings Carnival to Huntington Beach as our principal Frau Schoeneich is from the Rhineland!